Vassula has been invited to visit France many times. 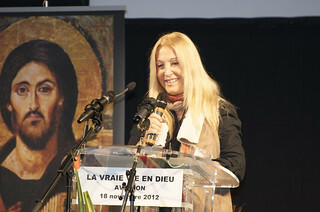 This time, inspired by the Holy Spirit, the association of “True Life in God” in France, decided to invite her for a “Marathon”, in order to stir up people and evangelize with the messages. In spite of heavy persecutions being laid upon them, the Lord’s Powerful Hand was with them to protect them and the meetings. The success was such as never before and un-paralleled to any other time! Even though there had been a circular sent out by certain French bishops advising the faithful not to attend Vassula’s meetings, the halls were next to full. In the meetings, there were mainly ‘new people’ who had barely heard of Vassula. Priests and nuns as well were present. 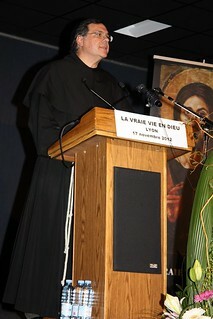 During this “marathon”, father Vincent, a Franciscan priest, and other members of TLIG accompanied Vassula. The organizers had worked very hard to organize meetings in 5 major cities in France: Lyon, Avignon, Nantes, Strasbourg and Paris. On November 15th, we arrived in Geneva. Jacques and Isabelle Gay welcomed us. It’s always a pleasure to meet each other and exchange ideas on how to expand the messages more efficiently. 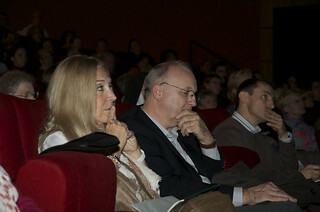 On Saturday, November 17th we drove to Lyon’s Congress Center, where members of TLIG, including Bertrand, one of the principal organizers of the event, and his wife, had been waiting for us. We feel connected to all of them, since they have been personal acquaintances of ours for years. Vassula’s speech was due to start at 3pm, but the stands with the books were ready two hours earlier. 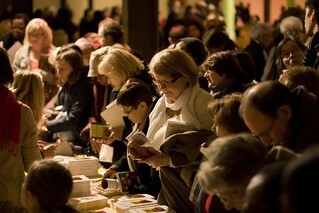 People had already started to arrive, browse through the books and ask for information. 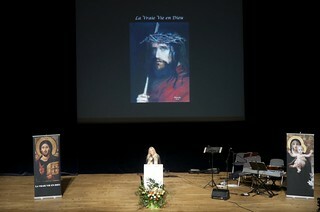 In the background of the stage there was a big screen with Vassula’s painting of Jesus as the “Ultimate Humility”. 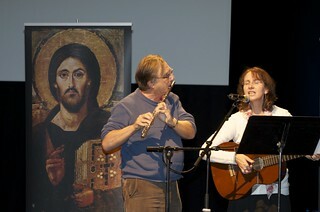 There was also a small orchestra that played Christian songs, while the audience sang along. There were around 900 people including some who drove in from Switzerland. 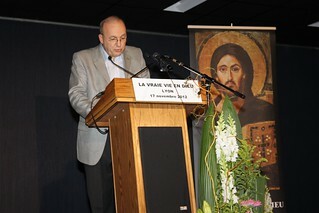 Vassula was introduced by Bertrand Vallancien, president of French TLIG Association, and Father Vincent. 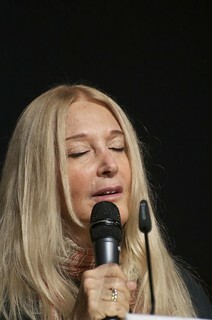 She began by praying the “Our Father” in the Aramaic language, the language of Jesus. 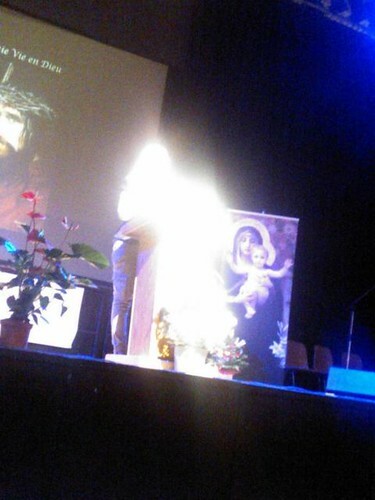 As most of the audience were newcomers, she began by relating her experience at the early dawn of True Life in God. Vassula recounted her experience of undergoing her purification and the difficulties she had in abandoning herself totally to God. She told them how she saw the state of her soul the way God sees it. This experience can be compared with the “Day of the Lord”, where we will see our soul though the eyes of God. 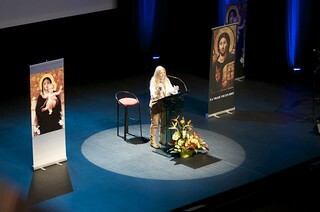 She spoke also about the importance of repentance, which is the gate that leads souls from darkness into Light. It is an act of humility and the humbler one becomes, the easier the Holy Spirit finds His way in the soul. It is through repentance that one enters into the unceasing prayer, where our spirit is completely absorbed in God and becomes sensitive of God’s presence. Our own will is all we have to offer Him and He wants us to surrender this part of ourselves at every moment of our lives. In this way He can use us as an instrument of His Will, which is Love: love Him with all our heart and mind, and love one another. Vassula also spoke about Unity. Jesus had given her a vision of three rigid iron bars and what Jesus asks of His Church. Vassula, at the end, invited the audience to stand up and pray along with her the Prayer of Repentance and Deliverance, given to her by Christ Himself. The prayer had already been distributed to the public. 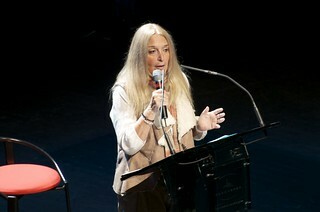 Her entire speech was simultaneously transmitted “live” on TLIG radio. After the speech was over, people rushed to buy books and posters, knowing that the latter were sold to support the Beth Myriams. 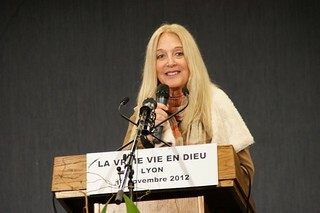 They were also given information about the prayer groups in Lyon and other places. 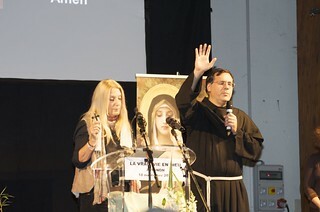 We departed with Father Vincent and Brigitte Charpentier for Avignon, where Vassula’s second meeting would take place at the Exhibition Center. Meanwhile, the editor of the magazine “Appel du Ciel” had been waiting to interview Vassula at the hotel where we were staying. On Sunday morning we attended Mass celebrated by Fr. Vincent and Fr. Froppo, a well renowned French exorcist and close friend to the Bishop Rey of France. Bishop Rey is very open to Vassula’s charism. Vassula’s speech started at 15:00, and, again, most of the audience had never heard about the messages before, so Vassula spoke again about the early dawn of TLIG with some variations. She put emphasis on the apostasy in our times and on the fact that God doesn’t want to see us perish. We are living a period of grace, and if God reprimands us, it is only for our own good. He always ends His messages with a tone of hope. At the end of her witnessing, everyone prayed the Repentance and Deliverance prayer along with Vassula a prayer our Lord wishes us to recite it daily. Clearly, Vassula’s talk had a deep impact on everyone as many people at the end of the event rushed to the stands for books, posters and to ask the organizers questions. Later on, we returned to the hotel where we shared a meak, thanking God for the successful outcome of the meeting. At each meeting, people were giving their names to be contacted to join in our prayer groups of France; this was a good sign, which said that the Holy Spirit touched them. In the evening, we opened the messages at random and the passage we read was from a message dated 23 April 1989, an encouraging message for those who spread the Hymn of Love. 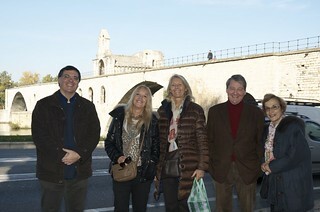 The next day, we visited the old city of Avignon with the old castle of the XIV century. On Thursday morning, November 22nd, we took the train to Nantes. It was a long journey, but it was a pleasant one because we were in the company of our TLIG friends. There was a one-hour delay, but nevertheless, we managed to arrive at the hotel on time to prepare for the 6 pm meeting. 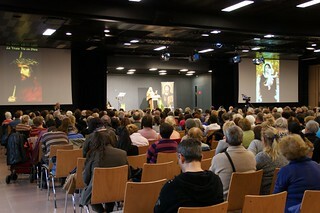 The meeting took place at the Conference Center “La Fleuriage” where about 550 people came to hear about the Messagesm many for the first time. Vassula related the beginnings of TLIG, again, and other important subjects and themes from the messages. The messages constitute a fabulous treasure and one could talk about them for hours. Vassula also referred to the prophecies and warnings mentioned in the messages that have been fulfilled. The next day we departed by train for Strasbourg, at the other end of France. It was a long journey. Upon arrival, we were welcomed by Etienne Zeller and other TLIG readers and volunteers. The meeting was held at Strasbourg’s “Congress Palace”. 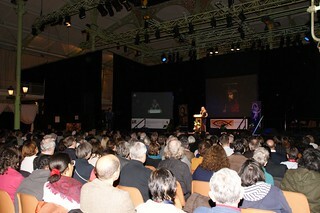 In spite of the negative announcement issued by the bishop of Strasbourg, the hall was filled early on. 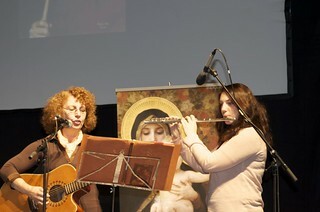 Around 800 people or more attended Vassula’s witnessing and there was a simultaneous translation in German for those who did not understand French. The Spirit of the Lord was clearly once more manifesting Himself through the witnessing of Vassula, for no one can be touched unless the Spirit is with the one who witnesses, glorifying God. The meeting was successful again and people rushed to get books and posters. I must add, that never before was there any time before in France in which the TLIG books went out so fast and to so many! 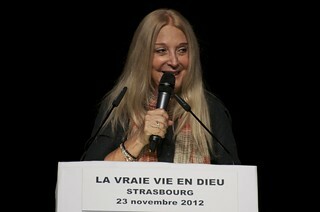 Vassula Ryden Delivers Witness Talk in Strasbourg, France, 2012"
The next day, November 24th, we took leave of our TLIG friends in Strasbourg and departed for the last stop of our tour, Paris. 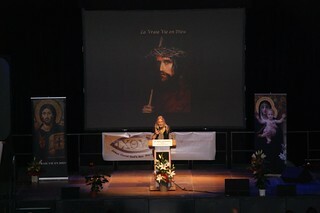 The meeting was took place in “Nogent sur Marne”, in the east of Paris, on Sunday, November 25th. In the morning, we attended Sunday Mass. The weather was fine and it had been so during our entire journey. 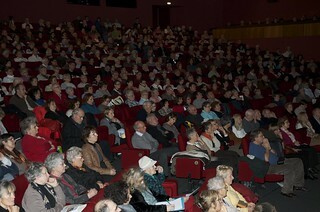 The meeting would take place at 3 pm at Pavillon Baltard, a huge hall that could sit 1500 people. Upon arrival, we were surprised to find around 1000 people already there. On the left of the stage there was a huge screen for people to see Vassula easier. 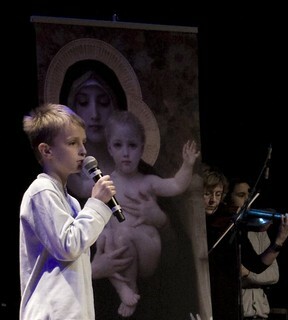 On the stage there was a beautiful children’s choir, warming the atmosphere. 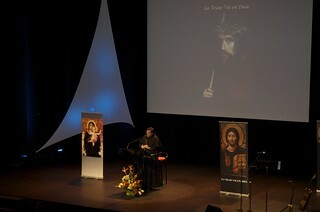 After the songs, a big surprise awaited us: a recorded message from Fr. 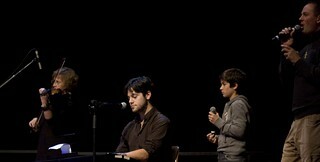 René Laurentin! He was unable to attend the meeting because he had had an accident and was in hospital, but nevertheless wanted to give his personal testimony concerning Vassula. He said Vassula must be one of the most persecuted mystics he knows and it is for two reasons: 1) she is an orthodox and 2) she is a woman… He has always been a fervent supporter of Vassula’s prophetic mission. 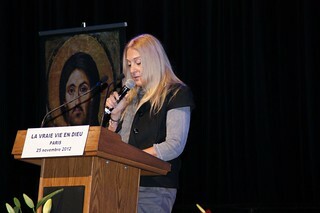 This time Vassula spoke about the importance and the necessity of witnessing in these “End of Times”. This is the time in which Satan unleashes his hatred amongst us. Jesus reminds each one of us that we must come to Him one day “with our hands full”, for the greatest service we can render God is to bring one soul back to Him. Our Lady asks us to become “apostles of the End of Times”. We were happy to see so many young people in the audience and again, people flocking to get the books after the talk was through. In the evening, we had dinner with the prayer groups in a warm atmosphere. We were happy for having worked together for God. 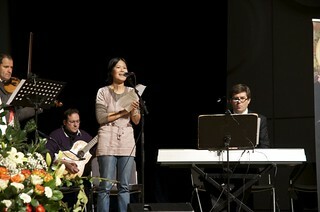 I thank God, because in his infinite Mercy He opened ‘new roads’ for His Love Hymn. Praised be the Lord! Let His Triumph come quickly upon this world!